Fantasy Book Critic: Paranormal fiction writer Lynn Viehl offers a Parallel eBook story to the Final Installment in her New York Times Bestselling Darkyn series! Paranormal fiction writer Lynn Viehl offers a Parallel eBook story to the Final Installment in her New York Times Bestselling Darkyn series! Onyx, an imprint of Penguin Group (USA), announced today the release of an all new “eSpecial”—short pieces of writing for eBook readers—from Lynn Viehl, the New York Times and USA Today bestselling author of the Darkyn novels. “Master of Shadows” is a parallel story to “Stay the Night”, Viehl’s full-length conclusion to the Darkyn series, which Onyx will publish in January 2009. The novella, featuring vampire Will Scarlet and his mortal love interest, offers readers a sneak peek into what happens “off stage” during the final installment in the Darkyn series. Viehl launched the Darkyn series in 2005 with the publication of “If Angels Burn”. Five more books followed, landing Viehl on both the New York Times and USA Today bestseller lists and earning her a loyal fan base. A blend of paranormal romance and fantasy, the novels follow the modern-day adventures of several warriors who were turned into vampires during the Middle Ages. “I think Penguin’s new e-publishing venture is a terrific idea. With the convenience of online downloads, readers will now have immediate access to new fiction at a very reasonable price. As an author, I appreciate the chance to reach the growing number of readers who enjoy eBooks. I'm delighted to be a part of the next step into the future of publishing,” said Lynn Viehl. As with all Penguin eBooks, the eSpecials will be available wherever eBooks are sold, in many formats, including those compatible with the Sony Reader, Amazon Kindle, and iPhone among others. 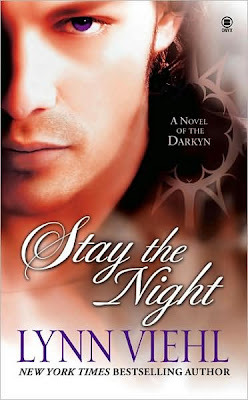 From now until “Stay the Night” is published on January 6, 2009, “Master of Shadows” will sell at a special price of $2.99. After January 6th, “Master of Shadows” will sell at the list price of $4.99.